Long before Dan Brown and the Da Vinci Code heaped attention on this extravagantly ornate chapel set on a low hill above Roslin Glen in the Midlothian countryside south of Edinburgh it had been a popular destination for generations of curious travellers. The chapel was founded in 1446 as a place of worship, a flamboyant expression of Gothic architecture that in time was described as a Third Temple of Solomon for the Knights Templar as well as a Grail chapel. 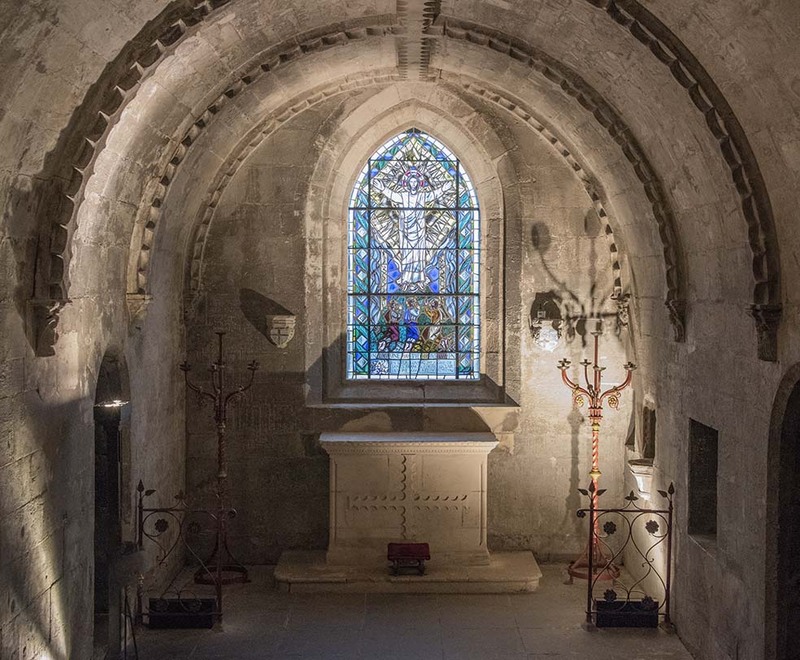 Dedicated in 1450 as the Collegiate Chapel of St Matthew, William St Clair, the 3rd Prince of Orkney, founded the chapel for his family with a staff of a provost, six prebendaries and two choristers. Collegiate chapels like this were intended to pray for the soul of the founder and to spread intellectual and spiritual knowledge. 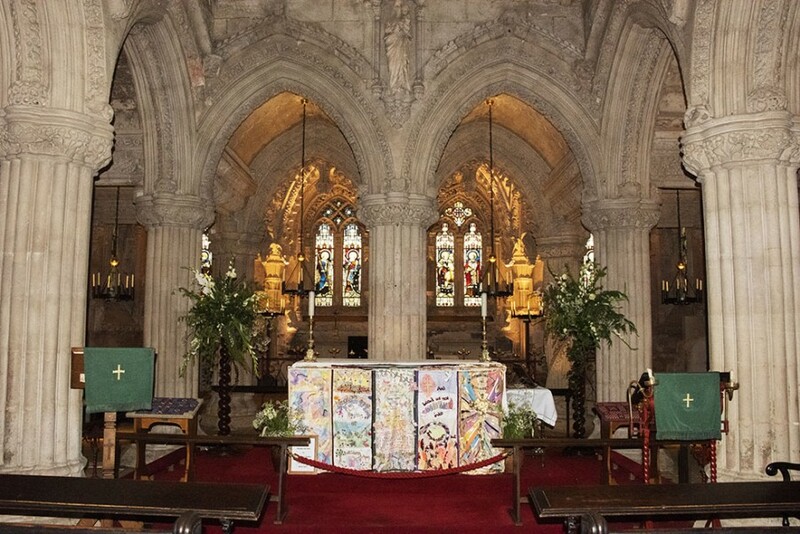 Before any literary attention, Rosslyn Chapel was being visited by around 9,000 people each year. When it was mentioned in The Holy Blood and the Holy Grail interest rose to more than 13,000 visitors a year. But it was Dan Brown’s book that inspired a sharp increase in fascination, with visiting numbers rising to well over 50,000 a year. 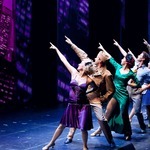 When the film of the book came out, visitors rocketed to over 150,000 a year, which is roughly where they plateau today. As an aside, the events and involvements described by Dan Brown are said by medieval historians to have no basis in fact. Any supposed links to the Knights Templar are said to be tenuous, since the chapel was built 150 years after the dissolution of the Knights Templar in 1312…unless, of course, the Knights Templar continued in secrecy. But don’t let this detail deter you from visiting this amazing place, nor fear of a repetition of the 1914 incident of suffragette vandalism reported in the Melbourne Argus newspaper when a canister of gunpowder left on a windowsill exploded. Even those accustomed to the often-ornate architectural detail of churches and cathedrals will be surprised by Rosslyn. Its beauty lies not in the outline but in the wealth of stone carving lavished on its clustered columns, pinnacles, niches, its vaulted roof, and the richly decorated Apprentice (or Prentice) Pillar, restored by the 3rd Earl of Rosslyn after it was damaged by a mob in 1688. 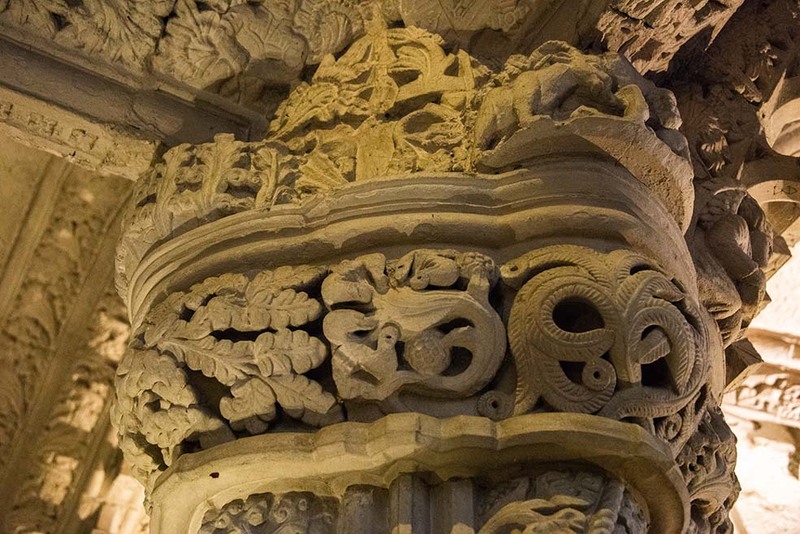 This opulently carved pillar is sought out by everyone and is linked to an 18th-century tale involving the master mason in charge of the stonework in the chapel and his young apprentice. According to the legend, the master doubted that his apprentice could carve the column without seeing the original which formed the inspiration for the design. So, the master mason travelled to see the original himself, but on his return was enraged to find that the upstart apprentice had completed the column unaided. In a fit of jealous anger, the master mason took his mallet and struck the apprentice on the head, killing him. The legend concludes that as punishment for his crime, the master mason’s face was carved into the opposite corner to forever gaze upon his apprentice’s pillar. On the architrave joining the pillar, there is an inscription that in translation reads: ‘Wine is strong, a king is stronger, women are stronger still, but truth conquers all’, a reference from an ancient Greek biblical text. 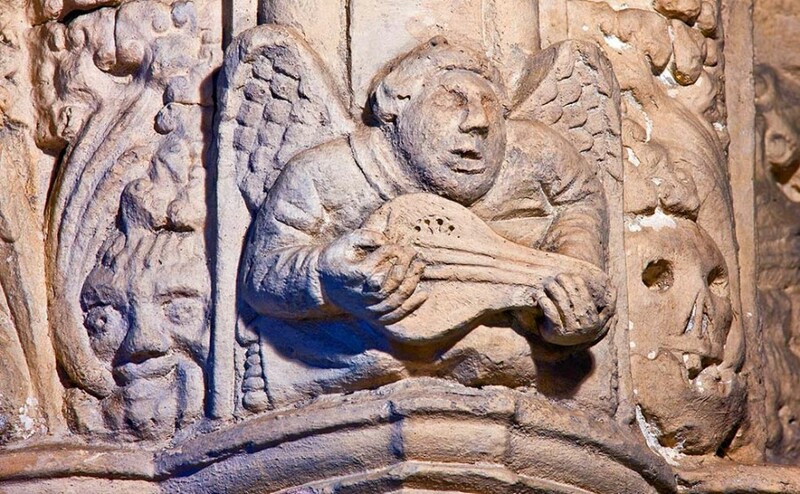 This aside, it is impossible not to be impressed by the vast array of carvings that feature in the chapel. There are more than 110 carvings of the Green Man, for example. Other carvings include plants such as wheat, lilies or strawberries. In another intriguing leap of hypothesis, it has been suggested that some of the carvings are of ears of New World corn (maize), unknown in Europe at the time the chapel was built. This has been used to posit that Henry I Sinclair, Earl of Orkney had travelled to America long before Columbus. And while some of the carvings do indeed look like heads of maize you can’t help feeling that such a coincidence ranks little above clutching at straws. As for the links with the Knights Templar, Solomon’s Temple and the Freemasons there seems to be a greater number of detractors than exponents. 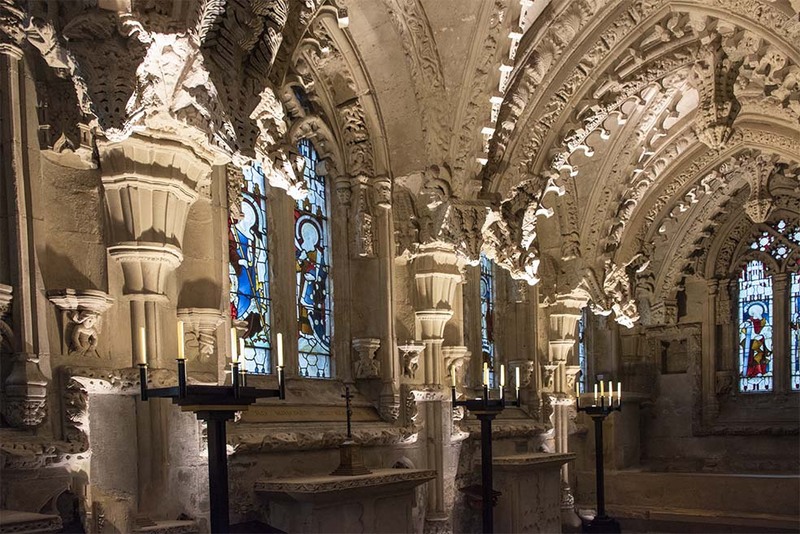 Robert L. D. Cooper, sometime curator of the Grand Lodge of Scotland Museum and Library, in 2003 published a revised edition of the 1892 Illustrated Guide to Rosslyn Chapel with the intention of countering the ‘…nonsense published about Rosslyn Chapel over the last 15 years or so’. In 2006, he also published Rosslyn Hoax? in which he actively debunks this type of speculation at length and in great detail. 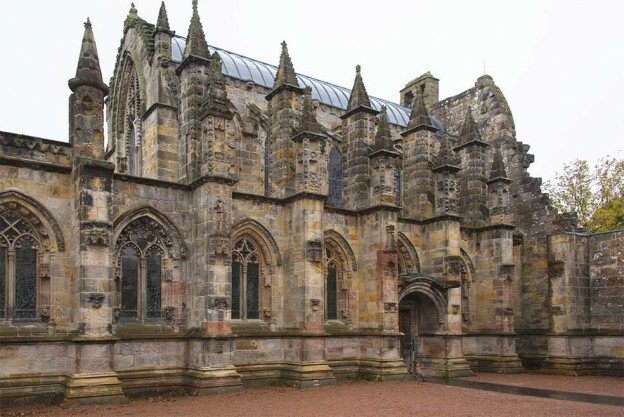 The claim that the layout of Rosslyn Chapel echoes that of Solomon’s Temple has been analysed by Mark Oxbrow and Ian Robertson in their book, Rosslyn and the Grail in which they take the line that the chapel bears no more resemblance to Solomon’s or Herod’s Temple than a house brick does to a paperback book. The chapel has seen a long line of distinguished visitors. Oliver Cromwell’s troops sacked the chapel in 1650, although the chapel was spared complete destruction and was used for stabling horses. Artist Alexander Nasmyth and poet Robert Burns visited the Rosslyn area, and in 1805 Walter Scott wrote The Lay of the Last Minstrel in which he depicts the building in flames on the night that a Rosslyn baron dies. In 1803, the Wordsworth brother and sister team visited Rosslyn, Dorothy describing the architecture as ‘exquisitely beautiful’, while William wrote the sonnet Composed at Roslin Chapel during a Storm. Queen Victoria, who passed this way in 1842, saw it in an overgrown state and expressed the desire that it be preserved for future generations. It was a while before her wishes came fully to fruition. Conservation work on the sacristy roof was undertaken in the 1950s, and a Trust set up in 1995 to care for the chapel. 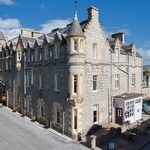 In 2007, the Trust was awarded almost £5 million in funding from the Heritage Lottery Fund and Historic Scotland and this lead ultimately to the modern visitor centre adjoining the chapel. 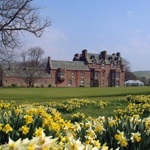 Whatever the myths, legends or weight of curiosity that draws you to Rosslyn, the certainty is that here you will find one of the most intriguing and elaborate buildings arguably in the whole of Scotland. It’s well worth the detour for that alone. The Chapel is located within the village of Roslin, off A701, and is open every day of the year except 24, 25 and 31 December and 1 January. Expect to spend at least 1 hour in and around the chapel. Guided talks are given (included in the admission price) Monday to Saturday at 10am, 11am, 12.15pm, 2pm, 3pm and 4pm, and on Sunday at 1pm, 2pm and 3pm. There is a coffee shop in the new visitor centre. The nature of the building is such that it is not fully accessible to anyone with mobility problems.